Posted in Bike Path, Comfort & Cruisers, commuters. The Uptown EX LS is Breezer’s stylish aluminum city bike for women in a frame design specifically made for easy mounting and dismounting: It’s comfortable, efficient, and an all-around pleasure to ride. The EX ST comes fully equipped with wide, comfortable tires, matching fenders, a chainguard, even a bell. And Joe Breeze himself designed this bike’s geometry, so anyone will find it easy to ride, while a proven, reliable Shimano drivetrain makes the EX ST simple to operate. 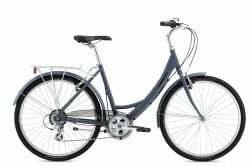 The Breezer Uptown EX LS makes great transportation for students and commuters, perfect around campus, cross town or just cruising through the neighborhood. The aluminum frame and a blend of aluminum components keep the bike lightweight and maneuverable. The Shimano drivetrain gives you reliable, consistent shifting from one of the most highly respected names in cycling, with 8-speeds to give you options for hills, quick accelerations, and just cruising along. 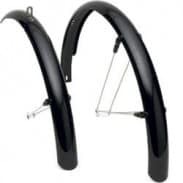 The Uptown EX LS has a 26″ aluminum alloy wheelset with Vera Citywide tires that have a slightly wider footprint will help you negotiate a variety of surfaces. You’ll experience a more comfortable ride that can take you on park paths, along greenways, across campus, or even dirt/gravel drives. With riser bars, a riser quill stem, a comfort saddle, and platform pedals, The Uptown EX LS will put you in a more upright comfortable riding position. You easily take in your surroundings as you ride, all without the stress on your shoulders, neck and lower back. It’s a great way to ride.